Are you ready for a chilly pass around category game? Players will be challenged to name an item with a specific starting letting in given categories. Such as "Name a sport, letter T." Sounds easy but when the clock is ticking you might find yourself freezing up. Freeze Up is a blast and a breeze to learn how to play. The handheld console is the main center piece that also keeps track of the time/score. Great for kids and adults alike and is a great game for almost any occasion. Buy your version of Freeze Up today. If you are the last player in the game with time remaining on the clock then you'll win. 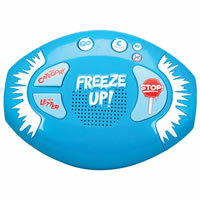 Included is the Freeze Up hand held console and the official Freeze Up game rules and instructions. Please keep in mind that the official Freeze Up childrens rules and instructions could be different depending on the game version you have. The rules below are some of the exact directions on how to play Freeze Up. Share with us your comments, funny stories, tips, advice, strategies, creative ways to play, questions about how to play, problems with the rules or anything you want about Freeze Up. All submissions will be reviewed within 24 hours. Click here to add your Freeze Up comments.